There is nothing as lovely as a delicate, delicious Macaron, except maybe getting a box of them delivered to you each month! Meet Pastreez. 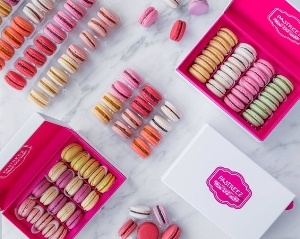 The Macaron bakery and subscription service that is shipping happiness one box at a time. The two chefs in charge of this delectable operation are Yami and Anthony. This dynamic duo are French Chefs from Le Cordon Bleu Paris, so you know you’re getting the best! They left everything in France to build their online store in the U.S. and now ship their boxes nationwide from their kitchen in California. I had the opportunity to sample three of their 14 flavors and I honestly can’t tell you which one was my favorite. The chocolate was the perfect blend of dark and light. I didn’t get a bitter aftertaste or an overly sweet beginning; which for me is exactly how I like my chocolate. In the vanilla, I was pleasantly surprised that I could actually taste the vanilla! My third flavor was the raspberry; a perfect blend of sweet without tasting artificial. I loved that the raspberry Macarons are heart-shaped! I’m already making a list of people to send them to for Valentine’s Day! Overall, I really enjoyed my experience with Pastreez. They communicate promptly and professionally, while making the entire experience feel personal. Their website is beautifully designed and easy to use. 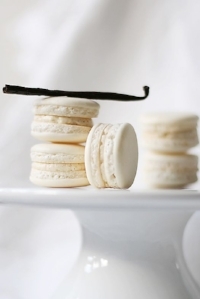 Your Macarons are delivered to you in temperature controlled shipping materials, so you receive the tiny desserts exactly as the chefs intended them to be. Their pricing is AMAZING and makes getting your own set of Macarons a luxury you can actually afford. I’m about to blow your mind with this next piece of information. Their products are also Gluten free and Dairy free. mind blown. You can head on over to Pastreez to learn more about all 14 of their flavors. Pastreez gives you the option to build a custom order: decide on the number of Macarons and choose your flavors. You can also sign up for their subscription box with chef selected flavors each month. If you are feeling really adventurous, you can order their Macaron making kit and try your hand at this French specialty.